Our journey through the US continues! This week, we are studying Massachusetts. It was the ship that brought the Pilgrims to America. It docked at Provincetown Harbor in Massachusetts in 1620. We also talked about how many passengers were on the ship and how long the voyage took. 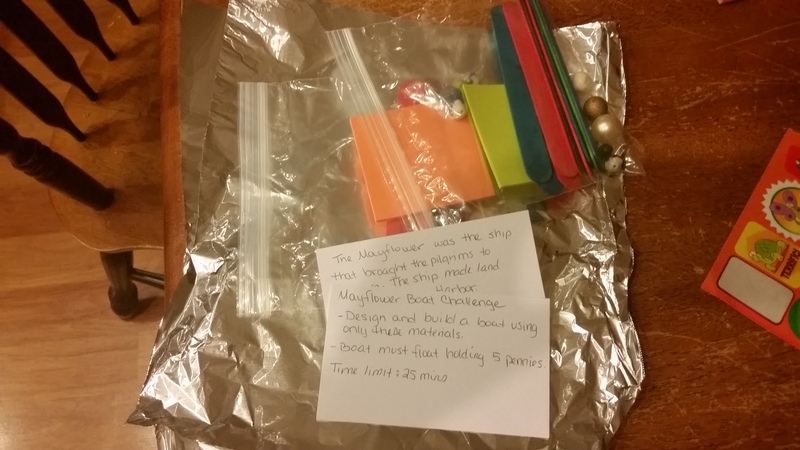 Under the notecard, there were two baggies with instructions and materials to build their very own version of the famous ship. 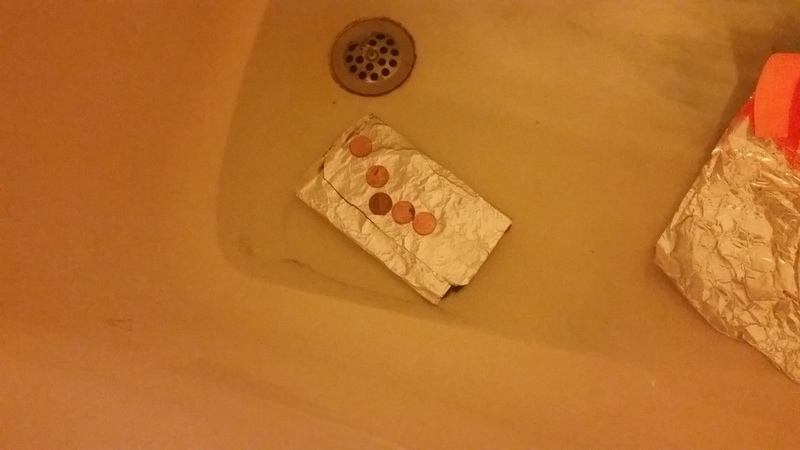 They were given 25 minutes to create a boat that would float holding 5 pennies. They could use only the materials listed above. Me: No, you can only use the materials in front of you. Jake: Ok, can I use a stapler? Me, with a chuckle: Nope. They had their materials and their mission, so I went into the kitchen to set the timer and wait. After about 15 minutes, Joe was done. His ship was big. 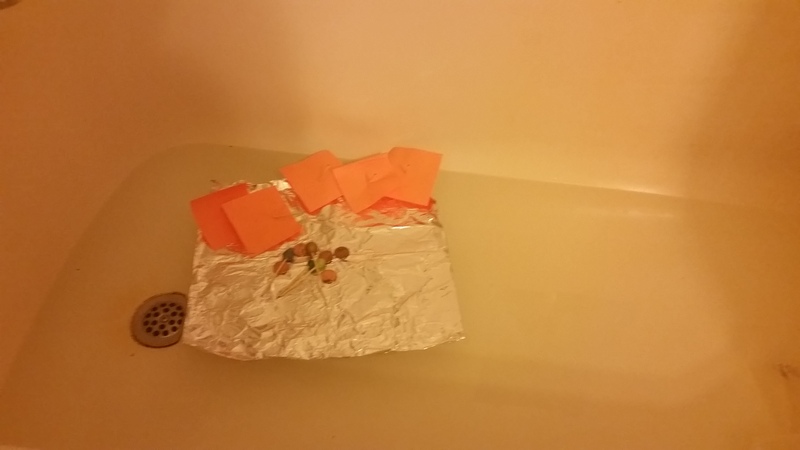 He’d used the whole piece of tinfoil so we decided to fill the bathtub to see if she would float. Using a little critical thinking and imagination, he was able to build the ship and make it float. Joe used the foil, post-its, beads and toothpicks. 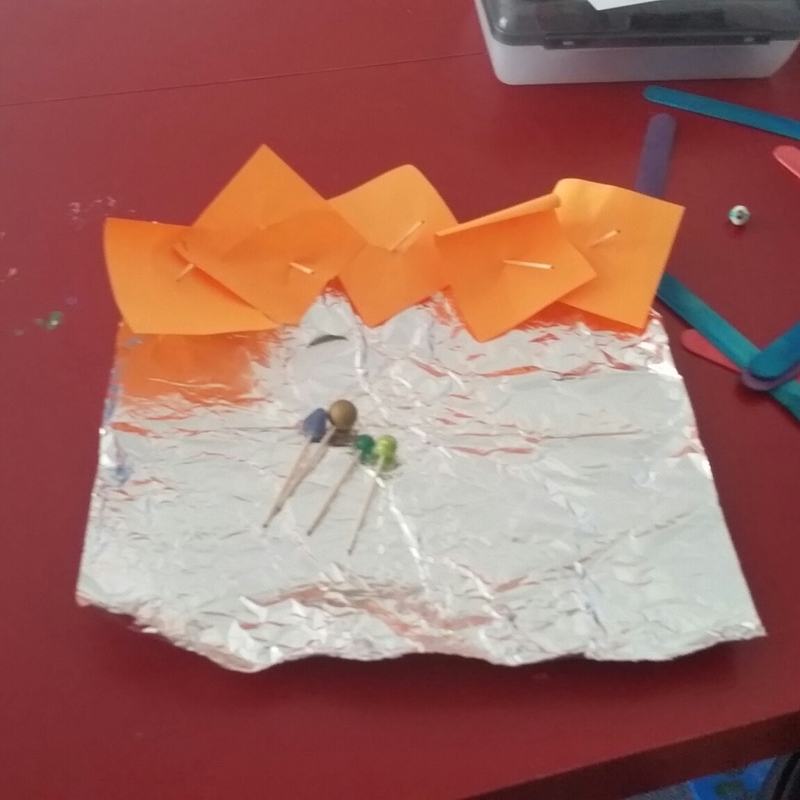 Jake used only the foil and popsicle sticks. He needed a little help, so Joe and I worked with him and built a little raft-like boat. They both had a lot of fun building it and Joe was quite proud of himself…as he should be! I found this idea on Pinterest–that wonderful resource and terrible addiction. 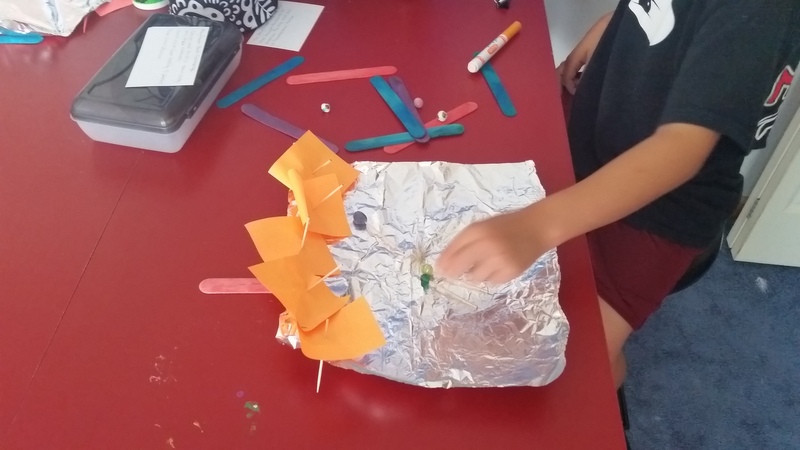 It’s a STEAM (Science, Technology, Engineering, Art and Math) activity, a challenge to use multiple skills to build a boat that floats with only a few simple materials. Although they didn’t realize it, they tapped into the majority of these skills with this activity. Joe was using the scientific method to design and construct the boat. He knew it had to float so he bent the sides of the tin foil up so it wouldn’t take on water. Although technology did not come into play with this activity, it could easily be modified to include documentation on the computer for recording findings and practicing keyboard skills. He planned and constructed the boat using his engineering skills to create the boat out of the supplies at hand. Using his art skills, he decorated his ship with beads on the end of toothpicks. He called these toothpick beads “mayflowers”. Finally, he used his math skills by forming lines and shapes to build the boat. This project was designed for older kids, but I modified it to fit the boys’ age and ability level. Jake needed extra help, so Joe and I both assisted him…although Joe was frustrated that Jake kept trying to use the stapler. Such a stickler for the rules…at least for this project. This entry was posted in Education, For the Kids, Homeschool. Bookmark the permalink.